Public information on tax and payments to governments by companies is often difficult to find and understand. But there has been a growing call for tax transparency around the world. Stakeholders including investors, governments, civil society organizations, media, and the public, are asking for more corporate reporting on tax. 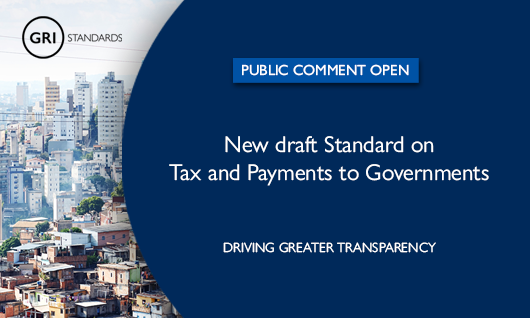 To respond to this call for transparency, the Global Sustainability Standards Board (GSSB) appointed a multi-stakeholder Technical Committee of experts to develop the first global disclosures on tax and payments to governments. The Committee began its work to develop a draft GRI Standard on Tax and Payments to Governments in January 2018. The draft is now available for review and public comment. Tax and payments to governments are a key mechanism by which organizations contribute to the economies of the countries in which they operate. If they seek to minimize the amount of taxes paid in a place, this can affect governments’ ability to finance vital public infrastructure and services, which is felt the most in developing countries. Greater disclosure on tax and payments will allow for more informed public debate, creating an environment for better policy development and investment decisions. At the same time, improved transparency could promote trust and credibility in the taxation system while discouraging organizations from engaging in aggressive tax avoidance practices. The draft Standard makes a pioneering stride in tax transparency by combining management approach disclosures on tax strategy, with country-by-country reporting of an organization’s business activities and taxes paid. Currently, multinational enterprises are obliged to disclose information about their tax position in their financial accounts. Public country-by-country reporting will move reporting a step further and increase transparency on the geographical distribution of an organization’s financial, economic and tax data. This could allow stakeholders to gain a better understanding of possible intra-group profit shifting activities aimed at tax saving in certain jurisdictions. Organizations also stand to gain from more transparent tax reporting. Corporate reporting on tax can be a means for organizations to increase their trustworthiness and accountability in the eyes of both their stakeholders and employees, and to strengthen their position in relation to the sustainable development agenda by contributing to the countries in which they operate through tax and payments to governments. Where and how to give feedback? The GSSB is looking for feedback to help make tax reporting more transparent and accessible to a wider range of stakeholders. If you are a reporting organization, tell us if the draft Standard is clear and feasible to report on. If you are a stakeholder looking to use the reported data, tell us if the draft Standard will deliver the valuable information you need to make sound assessments about an organization’s tax approach. The draft GRI Standard will be out for public comment until 15 March 2019. During this period, GRI will offer free webinars where stakeholders can learn more about what is included. Have more questions about the development of the draft Standard or what happens after the public comment period? Visit the project page to find out more or send us an email at tax@globalreporting.org.